Sherman Ewing was born February 21, 1935 in Luther, Oklahoma to J.D. And Anna (Dulan) Ewing. He was the surprise identical twin son born 5 minutes after his big brother Therman Ewing. Their family then gave them the nicknames 'Pete' for Therman and 'Repeat' for Sherman. They had an inseparable bond which continued until Therman's death in 2000. His mother and father later divorced and he had a step-father J.C. Curry who also helped raise him. As a young boy he and Therman spent every summer on the farm in Luther owned by his Uncle Tim and Aunt Mamie Britton a school teacher. Not only did they learn how to work the 200+ acre farm which had cattle, including dairy, pigs, chickens, raised wheat, and all other types of crops. He had every type of farm equipment needed to work a farm. They also had to read and do studies. His uncle Tim was a graduate of Tuskegee Institute, in Tuskegee, Alabama. He taught he and his brother the importance of hard work and saving. It became a part of them. Sherman accepted Christ at an early age. Although he spent every summer in Luther, he attended Douglas High School where he played football and basketball. After completing high school he enlisted in The United States Air Force while in his senior year. He received an Honorable Discharge in 1956 where he reached the rank of Sergent First Class. Early in life, he was married to Delores Weathspoon. This marriage later ended in divorce. To this union two sons were born, Sherman Ewing, Jr and DeWayne Ewing (deceased). Sherman held other jobs in Oklahoma City prior to meeting and marrying E. Mary Hill. She along with their son Barry Ewing and her children Larry, Gregory, Reata and Sullivan Nicholson moved to Geary, Oklahoma. As the story is told, they were moving to Pueblo, Colorado where her Mother and two sisters lived, but stopped in Geary to help her sister Lillian who had recently lost her husband Percy Crenshaw. What a great detour for them and for the town of Geary. While employed at Sequoyah Carpet Mills he was offered a job from then Chief, Jr. Kurtz to work as a patrolman, he along with Chester Brown, the first African American policeman started their career in Geary. 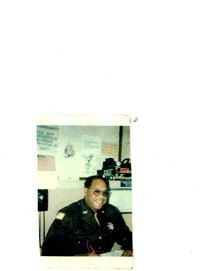 Sherman accepted the position full time in 1972 as patrolman, promoting to Chief of Police in 1978, a position he held until his retirement in 1996. After his retirement, he was asked by the City of Geary to come back to the police force. He came out of retirement to work for a while longer. Culminating in almost 25 years combined. Sherman had a way with people, he could get you to do something and you thought it was your idea. He was a mentor. Having helped many young men in the field of Law Enforcement who are leaders today. He was a man of second chances. He made many calls to parents to get their teens instead of locking them up. He believed in the ability of people to change. He influenced his grandchildren many whom he liked to brag about their numerous accomplishments. He was proud of all of them. Not only were he and his brother in law enforcement, they both were great cooks, and would host their birthday party every year with the names “Pete” and “Repeat”. Many people came to enjoy the food, wild game, deer, asian food, you name it, they smoked it, cooked it and knew how to handle it. Sherman also had carpentry skills and was an artist. He liked redecorating the house, hanging pictures and always wanted a new picture of the grandchildren. Once he began his career, he was dedicated to the profession and tried to learn as much as he could. He received more than 16 certificates of Education and training, Prison Gang Training, Cleet Certification, Uniform Crime reporting, Auto Extraction, Jailers Training, National Incident Based Report Training, Basic police training, Drug identification and handling, Jailers Training, Drivers Licenses and Collision reporting, Handling the Mentally ill and from the United States Department of Commerce. Tornado Spotters Training from the National Oceanic Atmospheric Association. and numerous other training not listed. He also received numerous community service awards. He also started the first Jr. Police Academy in 1978. He was recognized by the Geary Douglas Alumni for his service to the community. Sherman was called Chief by many and Grandpa by others but he was known as a strong, gentle friend. Sherman later joined Church of the Living God, Geary, Oklahoma and served dutifully under while they prayed for a pastor. He was later ordained Deacon by Bishop Miculous Griffis, Presiding Bishop of the Reformed Church of God in Christ, Oklahoma City In 2008. He continued to profess his hope in Christ with Sunday School and Bible Study. He studied Wednesday nights with the Beulah Land Church of God in Christ led by Elder Bookman. All three churches rotated church service between pastors. He loved them all. In 2013, he went under Watch Care with Rev. Dr. Johnson of the Macedonia Baptist Church, Geary. He considered all three churches his family. Sherman loved to fish, cook, work in in garden, smoke meats and have family around him. They did so by coming by to see him and bringing the grandchildren which were his pride and joy. On January 10, 2013 after a brief illness, God called him home. He leaves to mourn his wife, E. Mary Ewing of the home, Sons: Sherman Ewing, Jr., Oklahoma City, Barry Ewing (Sondra), Geary, Oklahoma, Step-children: Larry Nicholson (Betty), Oklahoma City, Gregory Nicholson (Laura), Port Elgin, Ontario, Canada, Reata Nicholson Bryant, Edmond, Oklahoma and Sullivan Nicholson, Jr., Geary, Oklahoma, He also is survived by a daughter in law Cindy Ewing, Moore, Oklahoma. Sherman is survived by many loving grandchildren and treated them all the same. He loved them all. That is the nature of the man. He leaves a total of 33 Grandchildren, 40 great grandchildren, 9 great great grandchildren. Loving Sister-in-Laws: Helen Arthur, Oklahoma City, Juanita (John)Murray; Ella (Monroe) Franklin, Pueblo, Colorado. and numerous other cousins, nieces, nephews relatives and friends. Rest in Peace Sherman! You were a very special man...one in a million and you are missed so much! Will always remember your smile, your contagious laugh, sense of humor and your wonderful bbq! To Sherman's family...please know that I love you all and am here for you all anytime you need me...Special love to Mary and Satia!